I have driven past Paisley Park for years and never realized it was the home of Prince. It stands just a few miles from the Minnesota Landscape Arboretum, one of my favorite destinations. Which is how I found myself squeezing into one of the limited parking spots on May 2nd, to take a few pictures. The crowds continue to come and pay tribute to Prince. New bouquets of flowers replace those which have served their purpose and new balloons cover deflated purple ones. To walk there is to hear stories, see tears and recognize the need of people to express that in some visible way. It was a somber place to visit. 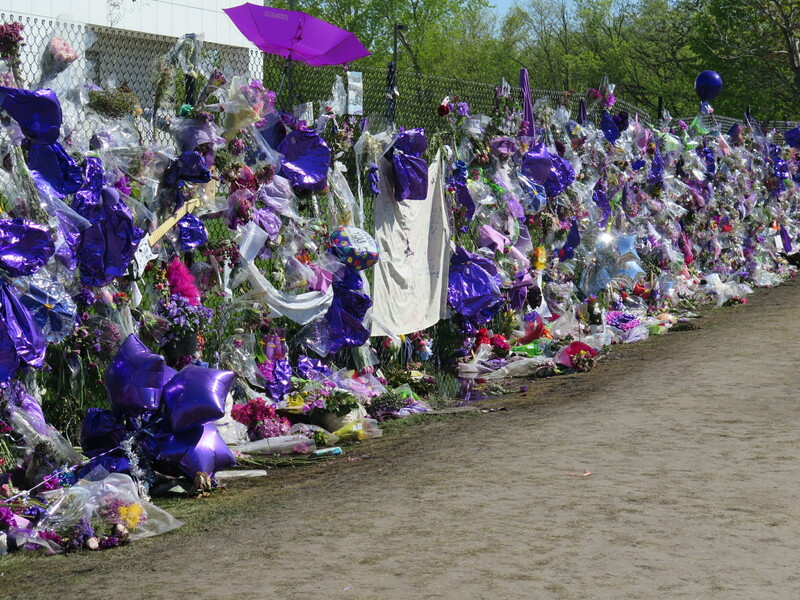 Tributes have come from many places lining the fences which surround Prince’s home and studio. Words from Germany, Holland, Australia, Tasmania along with several states are put together on one poster. A guitar is nestled in among the flowers. 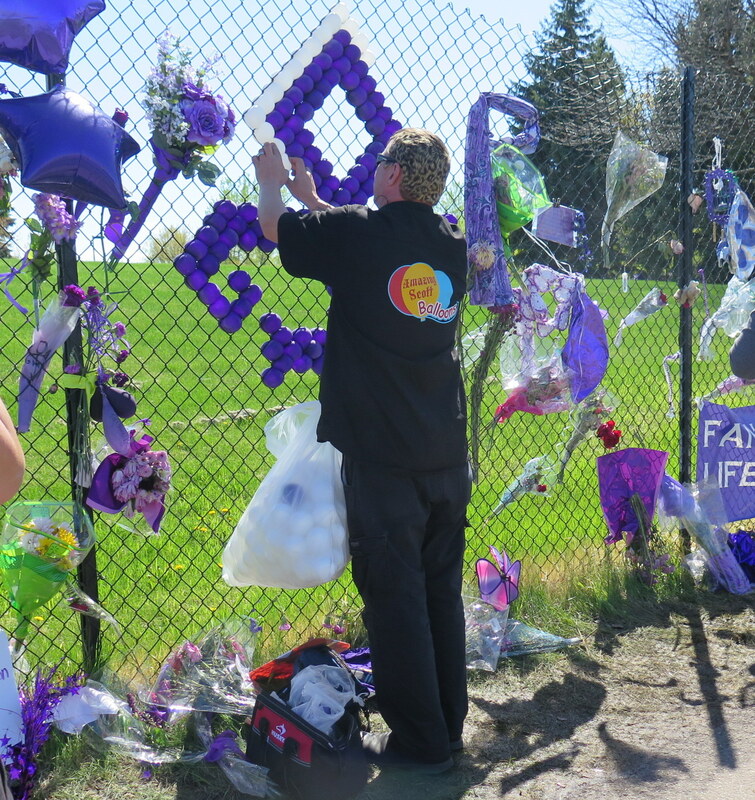 While I watch, a man makes a purple Prince sign out of balloons in a free spot along the extended fence. 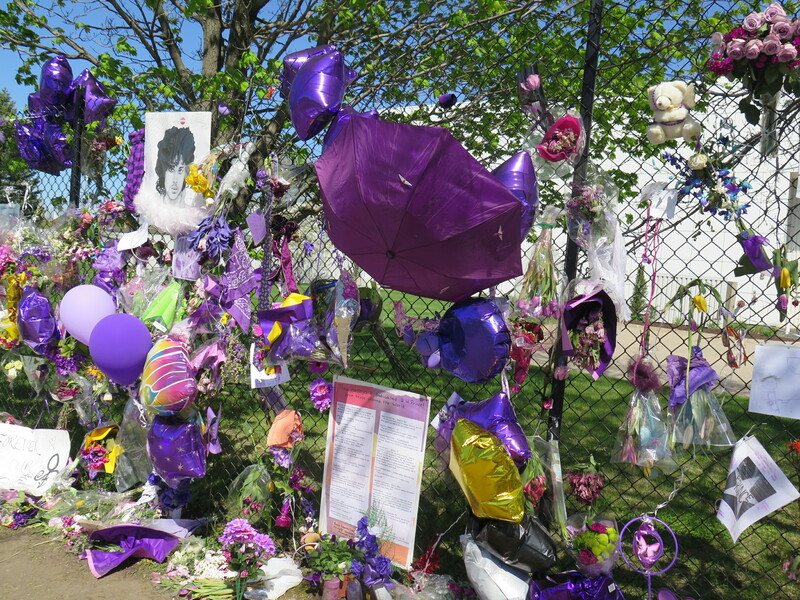 Purple umbrellas are scattered among the balloons. Messages include those who knew Prince as a friend and neighbor. There are pictures from children with purple rain falling. People wrote of their love for him, his music and his talent. A ribbon is woven into the fence and shaped into a heart, with flowers at the center. I have to admit that I would never count myself among Prince’s fans. But, it is hard not to see the millions of lives his music touched. Stories of Prince have circulated in Minnesota for years. This very private man would slip into clubs and sometimes, suddenly appear on set for the briefest of moments. While an investigation continues into his death, an addiction to pain killers is increasingly being revealed as a contributing factor. Meanwhile, people continue to come to leave their messages, to bring their flowers and mourn a person who brought joy to so many. On the day of Prince’s death, a rainbow stretched over his home. 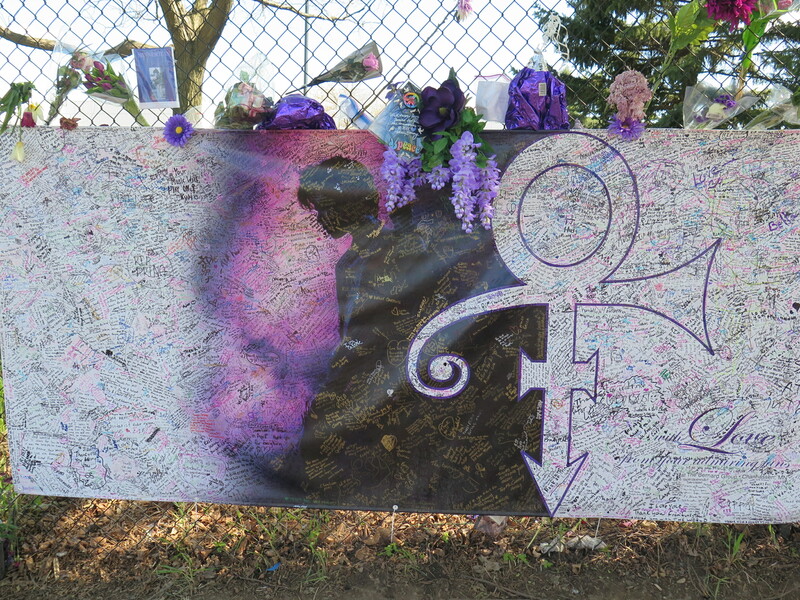 This entry was posted in Faith & Life, Grief and tagged A visit to Paisley Park, Paisley Park, Prince, Rainbow. Bookmark the permalink.